Heavily armed fighters from Al-Shabaab were reported to have retaken full control of a small town in Gedo region, southwest of Somalia, residents said Tuesday. 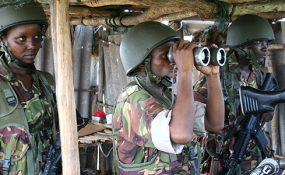 The militants in fighting vehicles rolled into Busar, located about 40 Km South of El-Wak town situated near Somalia's porous border with Kenya. The takeover came following the withdrawal of Kenyan forces who have been in control of the town since 2012, according to a local resident, who spoke to Radio Shabelle over the phone. Al-Shabaab fighters retook the area in Gedo region without a battle and announced their come-back in a public square where militant commanders lectured the villagers.